An Overview of Extraterrestrial Contact with Earth Beings. Covert Activities Presently Control Humanity’s Future. What Prevents Us from Learning About ETs. 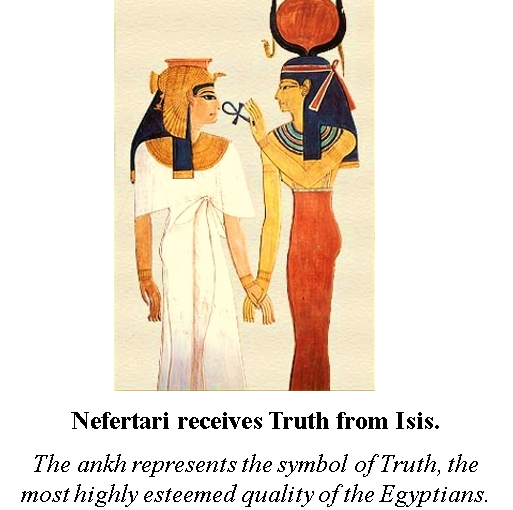 Obtain Knowledge of the Culture, History and Beliefs of ETs. Study the Culture and Life of Extraterrestrials. 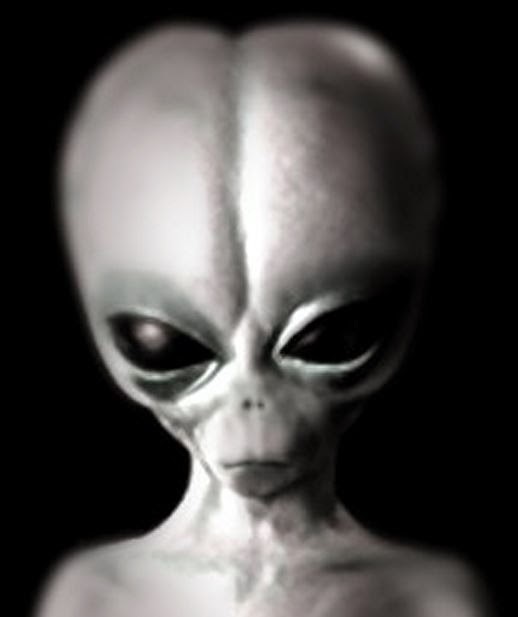 Study the History of Extraterrestrials. Study the Beliefs of Extraterrestrials. 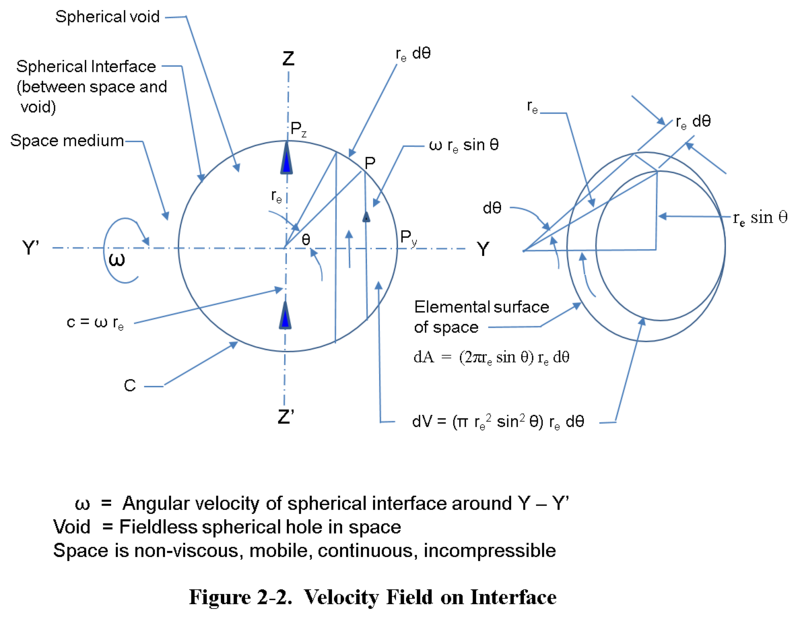 Conclusions and Recommendations Obtain Control of ZERO-Point Energy. Prepare to Enter the Universe. 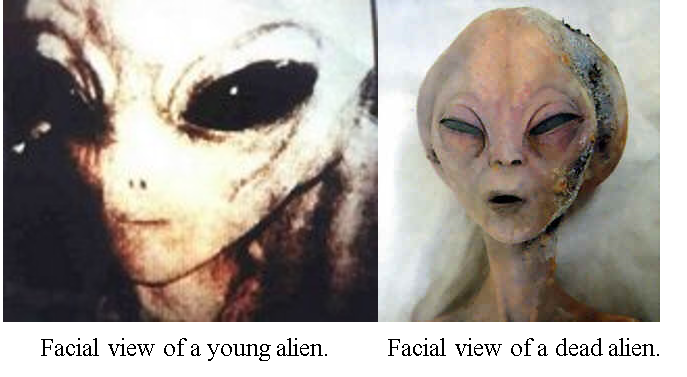 In spite of the wealth of valid information about extraterrestrials, little is known or conveyed about the culture, history and spiritual or worldly beliefs of ETs. With persistence, an Internet search brought up a book published in 2006 by George LoBuono, titled ALIEN MIND, The Thought and Behavior of Extraterrestrials. 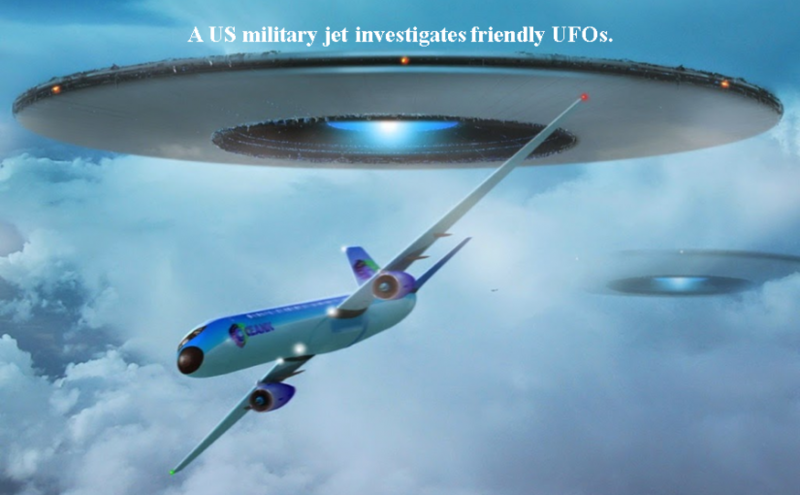 Although this author has not personally interacted with extraterrestrial life forms, he provides documented statements from highly respected members of the government, astronauts, military and CIA personnel that various types of ETs exists. With an acquired ability, he communicates with aliens using telepathy and remote sensing techniques that he describes in several chapters of his book. Mr. LoBuono claims to have communicated with aliens in various ways for thousands of hours since explicit interactions began in 1995. What is commendable about the author are his perceptions of how an alien views the behavior of human beings. He believes aliens are evaluating if humans may become a liability in the interplanetary world and if they are unable to control their desires for power and greed, inflicting death and poverty on earth. In doing so, he allows us to relate to the feelings and thoughts of visitors that come from another part of our universe. Still, it is odd that so little is known or written about the culture, history and spiritual or worldly beliefs of ETs. Since the beginning of ancient times, a limited number of UFO sightings have been documented and drawn by curious humans. With the use of camera technology, hundreds of UFO sightings were reported since the 1500s, and thousands more sighted after the 1900s. In fact, the military has actually recovered ETs from July of 1947 through July 1989. From downed UFO crashes, of a total of 128 ETs retrieved, 117 died and 11 ET beings have survived. 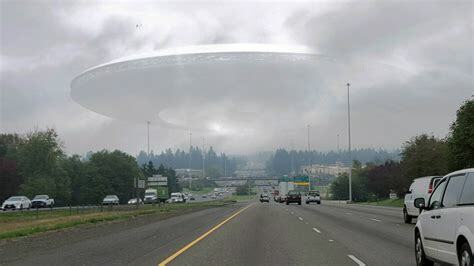 The scientists and phycologists who have actually spoken with ETs have been threatened with their lives and family not to reveal to the American people the existence of ETs. 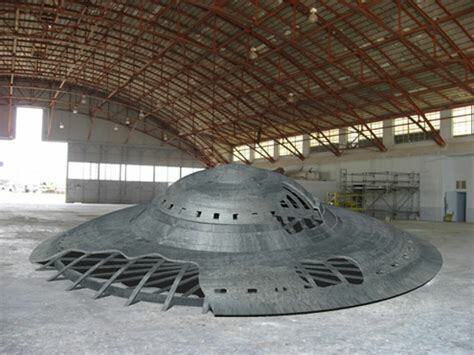 After the downing of an extraterrestrial space craft in July 1947 near Roswell, New Mexico, a highly secretive base was constructed in 1951 and identified as Area 51. Below is a photograph that was authenticated as being made in 1947 and therefore not something that’s been photoshopped like today. 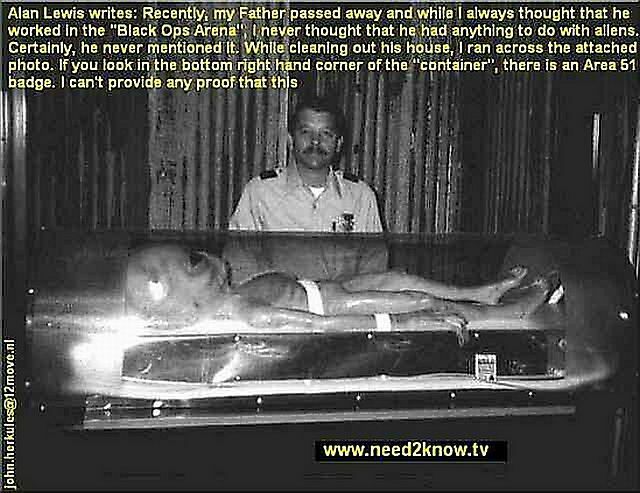 This original photo shows an alien who’s been partially dissected lying in a case. 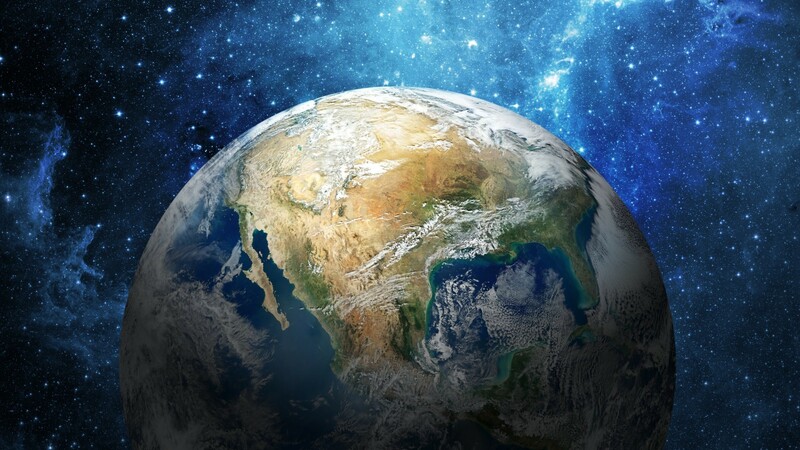 The article, Understanding the Extraterrestrial Mind, accessible on the link below, lists the 117 ETs that died and the 11 live ETs recovered at different areas both in the U.S. and other countries. But it also identifies that, since 1989, our scientific and military personnel have had the wonderful opportunity to learn from live ETs not only the technical aspects of antigravity and ambient zero point energy that enables space travel, but also to learn about their culture, history and beliefs; of greater interest, their knowledge about the beginning of the universe. 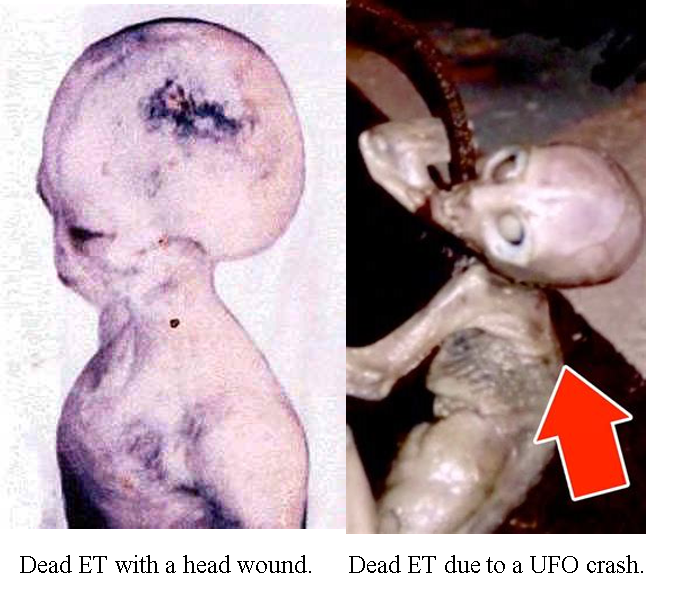 Many alien bodies are allegedly in the possession of the U.S. industrial military complex. It is a shadow Government not under the control of the President, Congress and Senate of the United States. 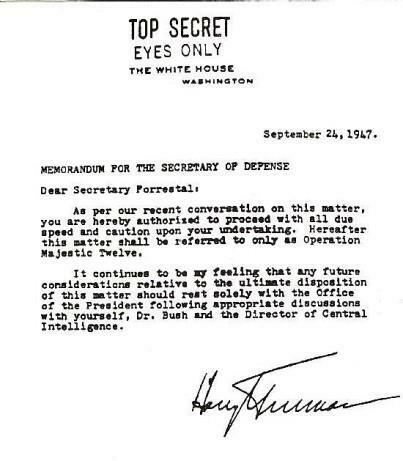 Top secret operations to study ETs and duplicate their UFO capabilities have been authorized by President Truman as confirmed by the document below. 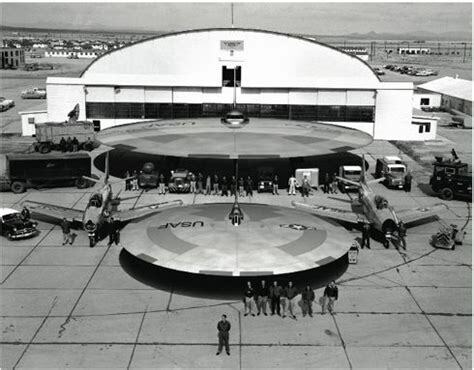 Although Operation Majestic-12 was established by order of President Truman, many U.S. presidents were denied access to newly developed UFO technology and any communication made with Extraterrestrials. Many ET remains and survivors are in secret underground compartments. Members of the White House, Congress and Senate have no control or accountability of the status of the ETs and technical UFO developments. They are blocked from all scientific and technical capabilities secretly developed in the hundreds of underground tunnels separated over many miles. In underground compartments, scientists and engineers who worked on ET UFO projects are isolated from one another so that no one scientific worker can access or acquire an overview of the entire program. 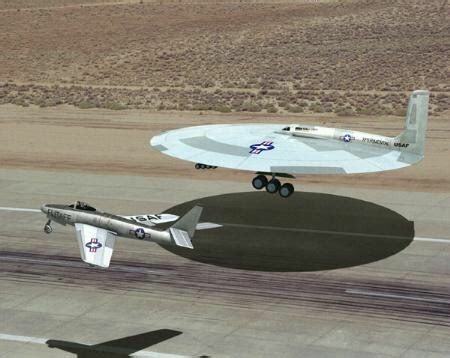 The covert program objective was to develop space craft using antigravity and ambient zero-point energy that can enable travel greater than the speed of light. Not to divert the reader from the subject of this article, because many readers have little knowledge about antigravity and ambient zero-point energy, a few paragraphs have been extracted from a video by Mark McCandish titled, The Feasibility of Interstellar Travel. His presentation was given for the Secret Space Program Conference in 2014. The video link below is provided for those readers who desire to learn more about the capability of space travel that can exceed the speed of light. Mark McCandish stated, “Advanced antigravity and zero-point energy propulsive systems enables electromagnetic or (ambient) field propulsion as opposed to solid object fuel, nuclear power, or any other commonly known conventional means. If you can find a way to reduce the mass of an object then it takes less propulsive force to push it around. It means it could go a lot faster because it is not limited by the amount of mass that it increases to as it accelerates. In fact, it may in fact be a situation where the faster you go the more energy you have available to continue the acceleration process and, at the same time, the mass is becoming relatively less and less and less so it really enables the possibility of being able to go faster than the speed of light without violating general relativity; and that what was the most fascinating aspect of the whole thing. Returning to the subject of this article, it is instructive to revisit the article, Understanding the Extraterrestrial Mind referenced above. It reveals that U.S. military and intelligence agencies conducted clandestine, high secret projects with aerospace corporations. These projects have been kept secret by top corporate, high ranking military members with support by such intelligence agencies as the CIA, FBI and NSA. 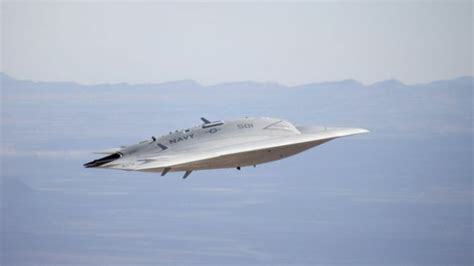 They were funded yearly, since 1947, with billion-dollar Government contracts, along with billions of dollars by covert members of the Illuminati to discover and engineer UFO capabilities for space travel. Americans, and people around the world, need to confront the covert military industrial complex to disclose all technological discoveries and engineered capabilities for use to benefit the quality of life for all human beings. The military industrial cabal operates as a shadow Government that is able to control the constitutional Government of and for the people. At present, the cabal has not released the knowledge gained for antigravity and ambient zero-point propulsion. Such capability can be engineered to reduce poverty by employing cheap energy to build homes, roads, planes, machinery, and increase the time gained for the intellectual, moral, and spiritual growth of human beings. Why is there is a lack of understanding about the mind and aspirations of ETs? This is a very important question. Surely, there are perceptive and intelligent people employed on the covert programs with the curiosity to understand the benefits of learning about another life form that has entered our solar system. It affords one of the greatest opportunities for mankind to learn how another civilization, from another star, has managed to evolve technically and morally to achieve mastery over the arrogance of war and stupidity that humans are prone to continually exhibit, possibly well into the future. However, corporate and military industrial leaders spend billions of dollars to use mass media via TV, news, articles, books, magazines and movies to provide false information of alien life forms. The FBI-CIA-NSA intelligence agencies and military industrial complex use mass media to program and distort the public views of ET life forms for the sole purpose of extending their control of new space energy technologies. Their objective is to induce fear of aliens to create a falsely perceived alien threat. By creating an external threat, it enables them to obtain continuous government spending, which increases their military power and wealth to control both our system of Government and human beings around the earth. Instead of inducing fear about alien life forms, intelligent people and government leaders worldwide should encourage learning the culture, history, and belief systems of the alien life forms that have survived a space crash or visited our planet. With kind, loving treatment and respect, they can provide knowledge for earthly people to become wise, moral, and learn about the universe we live in. 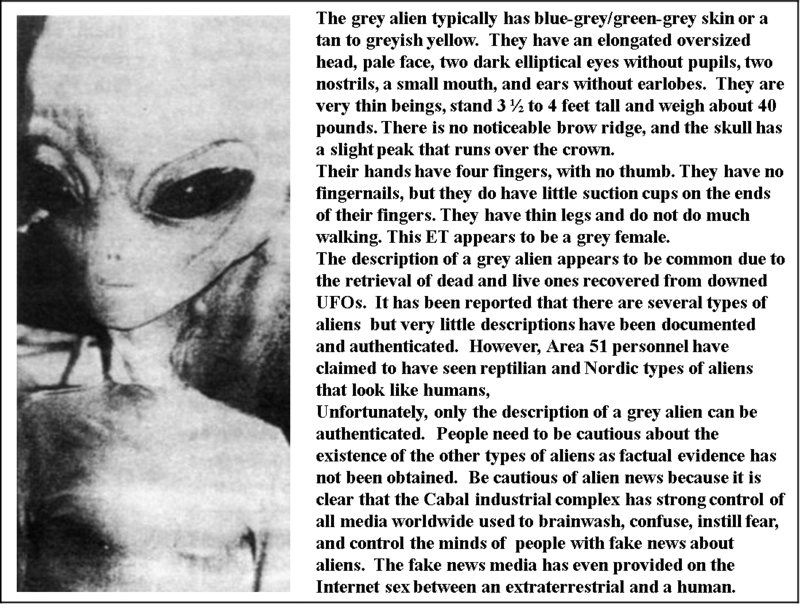 Below is what we know about the physical appearance of a grey alien. It would be wonderful to communicate with an ET. We can find out if they love music and if so, what instruments they may use. Do they love to dance, sing, and laugh? Are they sensitive to preserve many of their finest thoughts in written form? Do they appreciate art to capture beauty and retain worthy events? Do they enjoy and play sports? Are they competitive to match one’s intellect with various games, such as chess and checkers? 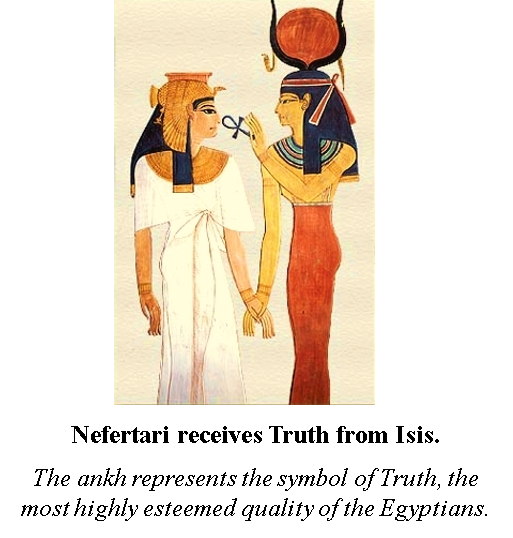 Do they enjoy the embrace of another ET and have desires to be sexually close and love another ET? What kinds of food do they eat? Does their planet have oceans, lakes and mountains? Do ETs strive to enjoy their physical capabilities and expand their intellect or, conversely, do they strive to be part of a whole where individuality is denied and controlled by collective group thought and behavior? In short, a whole other world opens us to the imagination and experiences of other life forms from which we can learn how we can better use the resources of our planet, adapt to the wonders of the universe, and join the life forms of other worlds. Humans can learn how another life form has been able to survive the elements of their planet. Did they have to overcome food shortages, which necessitated control of territories? 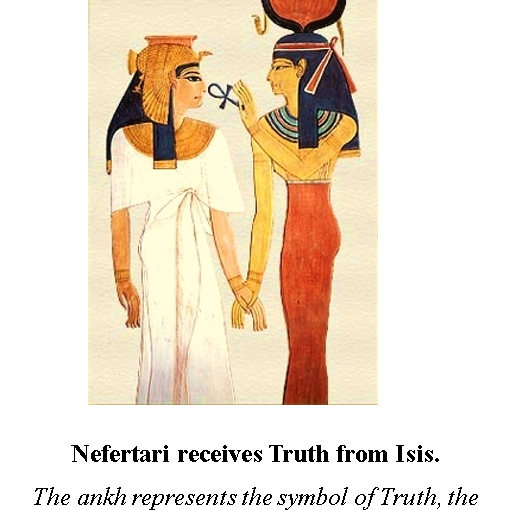 Were they populated with one uniform physiological group of beings or were there differences in skin color and physical appearances that may have caused biases and confrontations? Did they develop a moral code of conduct so that different groups of beings can abide in peace with a standard set of rules to live by? When did they invent modes of travel on land, sea and air. What were the different kinds of technology, developed in different periods of time, to raise their quality of life? Did ETs elect leaders that would benefit their group of people based upon intellect and integrity or was it a slow development that started with those who were physically stronger and relied on strength? Have ETs documented their periods of strife, be they wars and poverty, and admire those leaders that turned havoc into promising outcomes for the future? Have the experiences of history incentivized ETs to instill the attributes of truth, sincerity, and morality into their youth? There is much one can learn from history that reveals the mistakes made in the past either by physical, ethnic, or control of organic and mineral resources. One can learn if it was the need for resources, which caused one group to fight another for control or was it due to ignorance and intolerance of another set of views by a particular group. History provides a documented past that teaches how differences can be resolved. Do ETs examine their past to avoid repeated failures and strive to adjust their present views for successful outcomes in the future? Study the Beliefs or Worldly Views of Extraterrestrials. The human race is constantly evolving both technically and psychologically. Humans have advanced in the technical spheres, but due to the many diverse views about spiritual, religious, and philosophical beliefs, there is no common agreement in a belief system they can all embrace. As a result, much conflict has arisen that has resulted in hatred, violence and death of many human beings. It would be of benefit to learn if ETs have solved their ideological differences and arrived at an acceptable view of the beginning of the universe and revere their special gift of life to explore its wonders. Mr. LoBuono, in his book, Alien Mind, presents a chapter titled, Are Aliens Religious? He presents a view of aliens that is not credited to any specific ET contact and therefore is suspect of fabricating his own spiritual and philosophical views. However, he does allow us to consider if aliens believe in God or a Creator. LoBuono assumes that aliens usually don’t think of a single super-being and instead, “they talk about a multiplicity of intelligences that can converge in a collective community of mind, which you participate in and are part of.” This statement seems to indicate that aliens have no belief in spirituality or a Creator but rather, in a universal sense, they interface with many faceted intelligences to try to reach a collective community of mind. This may mean that a uniform code of morality is not taught based upon a supreme being but rather, an evolving exchange of views that constantly searches for an answer that becomes intellectually sound based upon experience and scientific knowledge. In other words, Mr. Buono believes aliens think at a universal level that involves sharing the intelligences of extraterrestrials of other worlds in formulating a belief system that may eventually be common to all. 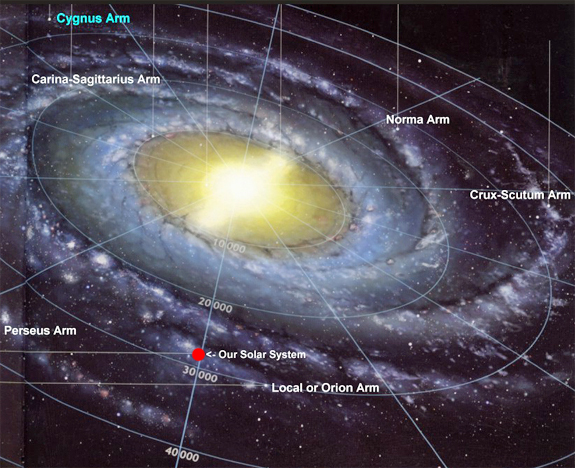 This is a view that, in my opinion, would not be achieviable because just as humans have different religious views, so would aliens from many stars of many galaxies. Mr. Buono gives no credence to alien adherence to a singular God belief. 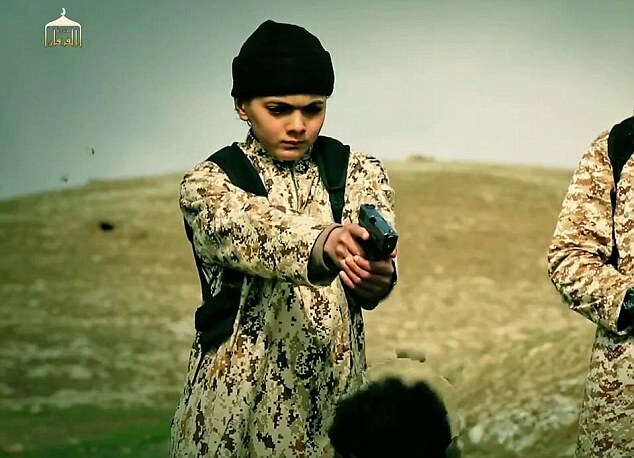 Unfortunately, he does not even reflect if ETs indoctrinate their youth with a moral set of rules that provides structure for such attributes as integrity and truth. 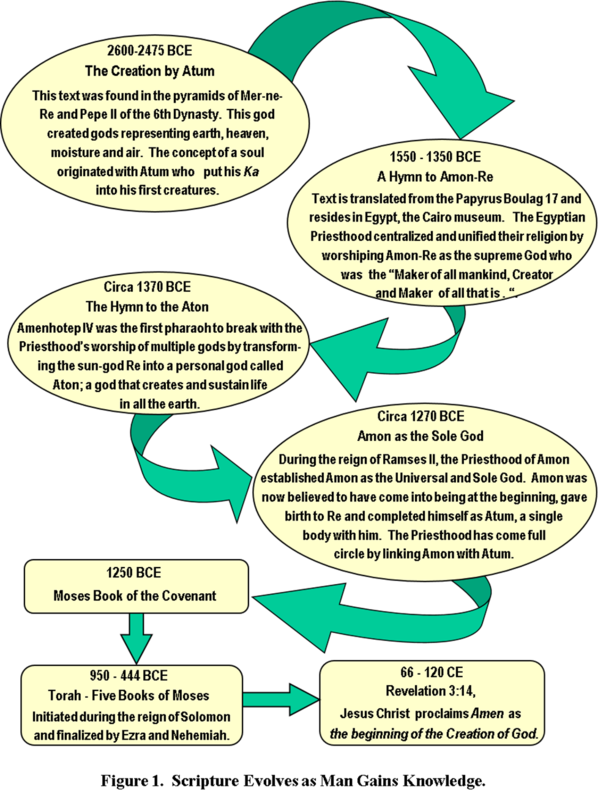 There is much for humans to learn if ETs, in civilizations throughout their history, had any spiritual or religious views in the early stages of their development. If they do not believe in a spiritual entity, do they believe in instilling their youth with a moral set of rules that reveres truth and integrity? Exposure to the belief systems of extraterrestrials would cause religious institutions, such as Judaism, Christianity, Islam, Buddhism and Hinduism to question and modify their religious beliefs. This exposure may cause more strife, violence and deaths. Can humans advance to a higher level of spiritual and intellectual being so that they may be accepted by the many life forms in our universe? 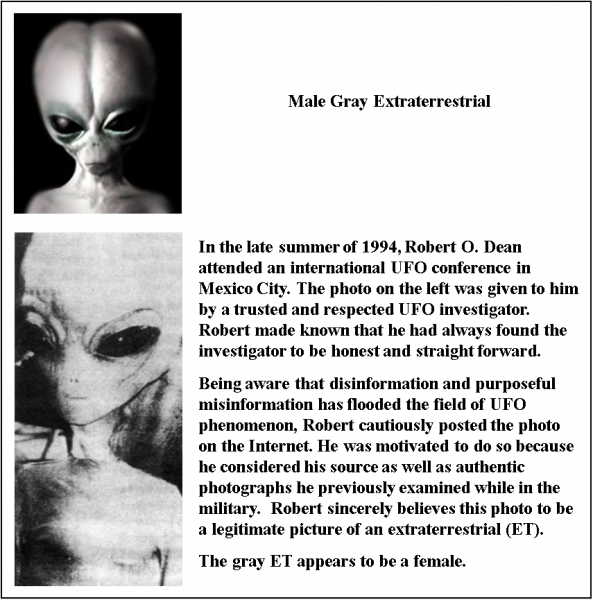 Below appears to be a photo of a grey male Extraterrestrial. Americans and people around the world need to insure their government obtains complete control of all technology developed in secret underground complexes; developed with or without the assistance of extraterrestrial beings. There must be complete disclosure by the military, CIA, FBI and NSA intelligence agencies for the release of the highly advanced technologies that allow for space travel using antigravity and ambient (free space) zero-point energy. In addition, large aerospace and scientific corporations that have been supporting the secret development of such technologies have got to release whatever patents they have to keep secret the innovative inventions developed through the support of the American taxpayers that financed the military industrial complex. Availability of the space technologies developed will allow an open, free enterprise system to operate in a transparent manner. It will help to create many jobs around the world to solve poverty, decrease pollution of our planet, and increase the quality of life for all people. Recommendations to Obtain Control of Zero-Point Energy. The human race can no longer tolerate control by the cabal (a self-serving elite) and military industrial complex that seeks to maintain their control of wealth by initiating conflict and war to increase their production capabilities of destructive weapons. The Honorable Paul T. Hellyer, Former Minister of Canada, deeply cares about the future viability of human life and our planet earth. In the video below, titled The Money Mafia, the World in Crisis, he has indicated that the United States is in grave danger. Paul Hellyer has advocated that the International Security Act of 1947 be rescinded or suspended to enable the American people to obtain control of the Cabal’s dominance of the U.S. Government and disclose and make available all developed technology and documents that were developed for space travel. 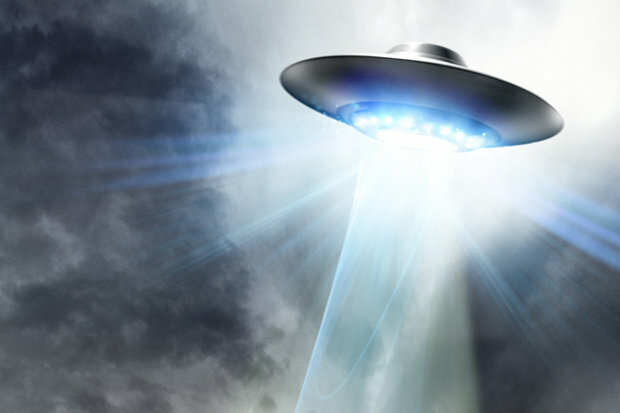 To facilitate the truth be known about ETs and UFO technology, a general amnesty and reconciliation process be granted so that all members of the military and intelligence agencies can tell the truth without fear of retribution. 1. The President must issue a presidential order that will release the secret patents on exotic (zero-point) energy and make them available to the world. 2. Make available the developed ET UFO technology and devise a flexible financial system that will make it possible to convert from an oil economy to a clean economy in seven years. 3. Utilize zero-point technology to run manufacturing plants, cars, trucks, tractors, ships, planes and homes with zero point energy that does not require bio fuels. 4. Change the banking system in order to finance the zero-point revolution that is necessary for the future of our planet and of our species. 5. The Cabal is very corrupt and their members must be revealed so that people can regain the balance of power to improve the lives of the sick, disadvantaged, and the poor. Recommendations to Enter the Universe. It is time for people, in all parts of the world, to confront Government leaders to disclose and release all inventions developed on the top secret-covert projects that enabled the development of UFO space mobility. But in concert, Government leaders in all countries have got to reveal the reality of ETs by allowing their people to learn about the culture, history, beliefs and aspirations of ETs. President Trump has initiated and funded a Space Force for defensive and space exploration measures. But there is much for our government leaders to do in order to educate their people to accept the reality of Extraterrestrial beings. First, we need to initiate and implement the recommendations briefly presented by Paul Hellyer. Second, we can no longer hide the truth about the existence of ETs. It is for certain that arrogance and fear prevails by religious leaders that by revealing knowledge of extraterrestrial life forms, religious beliefs by the people will be weaken and no longer revered. But this is the same arrogance by members of the Cabal and military corporate-industrial complex for they fear control of their world order will be compromised because it is the existing religious ideologies that allows them to ferment biases, hatred, differences, and conflict that support wars, obtain wealth, and maintain control around the world. Third, let the truth be known that ETs are real and on our planet. 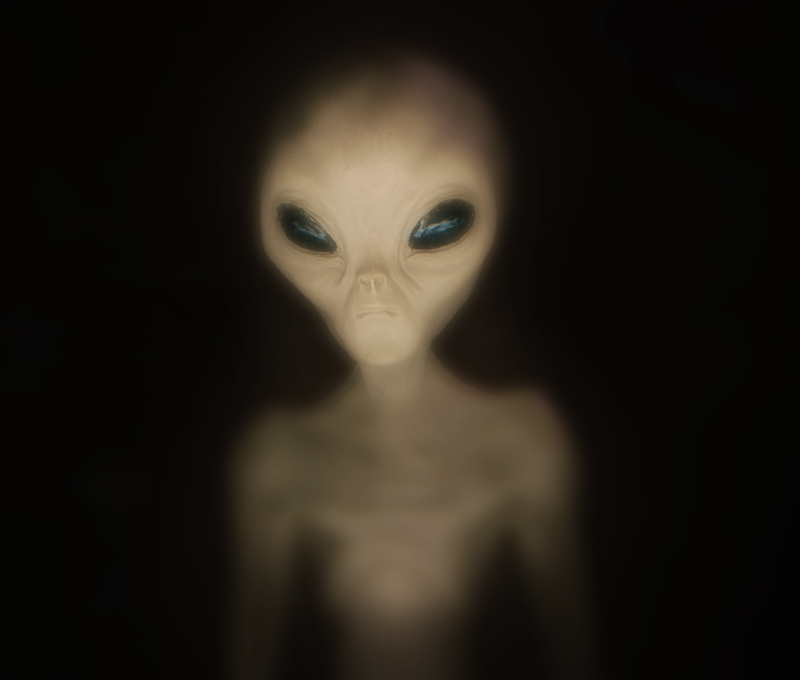 Extraterrestrials have personally interacted with scientific and military personnel on top secret ET UFO programs. It has been confirmed by members of the Cabal’s military industrial complex, in spite of sworn secrecy and threats of death to them and their families, that they have actually spoken with ET beings in the underground secret compartments. 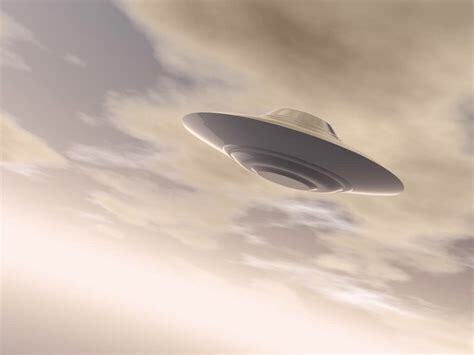 We have captured many aliens from downed UFOs and it was last reported that since 1989, there are at least 11 ETs alive who are cooperating with our scientists and engineers in the development of space technology that will allow space travel at multiple times the speed of light. Fourth, we cannot allow stupidity and arrogance prevent knowledge of ETs. As soon as possible, the Cabal’s industrial military complex must provide the live ETs to our government officials so that they can be introduced to the American people. Are people so stupid and ignorant that they are unable to accept the reality of ET beings? Of course not!!! We must celebrate that there is indeed life that has entered our planet. There is so much we can learn from their thousands of years ahead of our technology and knowledge. The benefits would be exceedingly great as they will be able to not only advance our technologies, but they will be able to assist humans in curing cancer, extending our life expectancy, and more importantly, provide cultural, philosophical and spiritual knowledge that can advance the integrity of human beings. Such knowledge will allow human beings to be accepted by the family of life forms in the universe. Fifth, change course of human development for the future promise of space. This can be achieved, but in baby steps. It means that we must be realistic and honest within our own minds by not being afraid to revise our indoctrinated religious beliefs. There will be continued beliefs in God and an afterlife but there must also be an open mind to examine ideologies that may be more realistic based upon the new alien worlds humans will be exposed to. In concert with religious leaders revising their scriptures to advance a common belief and set of moral values, all educational institutions, beginning with elementary through colleges and university levels, must insure they teach the principles of honesty, integrity and truth. Today, as evidenced by the corruption in our most honorable institutions, the FBI, CIA, and NSA intelligence agencies; the rampart dissemination of fake news in the media to discredit the President of the United States; media misinformation about ETs and UFOs; and poor appreciation of our freedoms where students prohibit the expression of divergent views; we as a people, have lost the most important aspect of being human, the ability to be truthful and love one another. All Americans should be thankful that President Trump loves this country and its people to stand up against the Establishment embodied by the industrial corporate complex, corrupt intelligence agencies, and media that want continued control of the U.S. Government and the minds of its citizens. To verify that there is control by a shadow government one need only question why Hillary Clinton is not in jail for destroying evidence on computers with over 33,000 e-mails, many of which will reveal pay to play international schemes. Is it because the FBI and CIA has corrupt officials that gave Hillary a free pass? This is a sad commentary on our present system of Government whereby the military industrial complex has penetrated many levels of our political and justice systems. We also note the one-sided justice by the Robert Mueller investigation of President Trump for possible Russian collusion with no investigation of a paid Russian dossier by Hillary Clinton. It appears that the corrupt government politicians and law enforcement agencies believe the American people are dopes to accept unequal treatment under the law. Lastly, the challenge is for all humans to love one another. Needed changes in how we perceive our spiritual and human values are embodied in the greatest command, given by a man of God, love one another. This means that the major religions, namely Judaism, Christianity, and Islam have got to revise their beliefs and advocate the attributes of integrity and truth, which are fundamental in professing love for one another. To travel into the universe and join the family of Extraterrestrials in other worlds, people from all countries must unite their spiritual and personal beliefs. They must highly regard truth and integrity and give each other the greatest gift – love. To fall short of the need to advance to the next stage of our spiritual and mental development, humans will continue to be pawns of the Cabal, Industrial Military Complex and the News Media. For further your knowledge about ETs and UFOs, please view the link below to access many videos by Steven M. Greer MD. He left his profession as a practicing surgeon to inform and educate all people about ETs and UFOs. His objective is to unveil the secrecy and suppression of ETs and UFO technology by a shadow government controlled by the industrial military complex. More importantly, he heads a global disclosure effort to eliminate the false information about ETs and inform people worldwide of the zero-point energy that must be utilized to improve the quality of life for all people and preserve the beauty of our planet. As a start, I recommend viewing the six videos titled Free Energy. Most educators and many scientists believe that the universe began with the explosion of one singularity named the Big Bang. It is a theory that is the prevailing cosmological model for the universe taught in many of our schools and universities. This theory was preceded by George Lemaitre, a Belgian priest and physicist. An ordained Catholic priest, Lemaitre published a scientific paper in 1927 where he claimed the universe was continually expanding. His theory was supported in 1929 by Edwin Hubble who postulated expansion of the universe by observing that distant galaxies where moving away at faster rates. However, in 1931, Lemaitre announced that the expansion of the universe began from an incredibly small, dense point of matter, which he referred to as the ‘primeval atom.’ Today, many people refer to this event as the Big Bang. 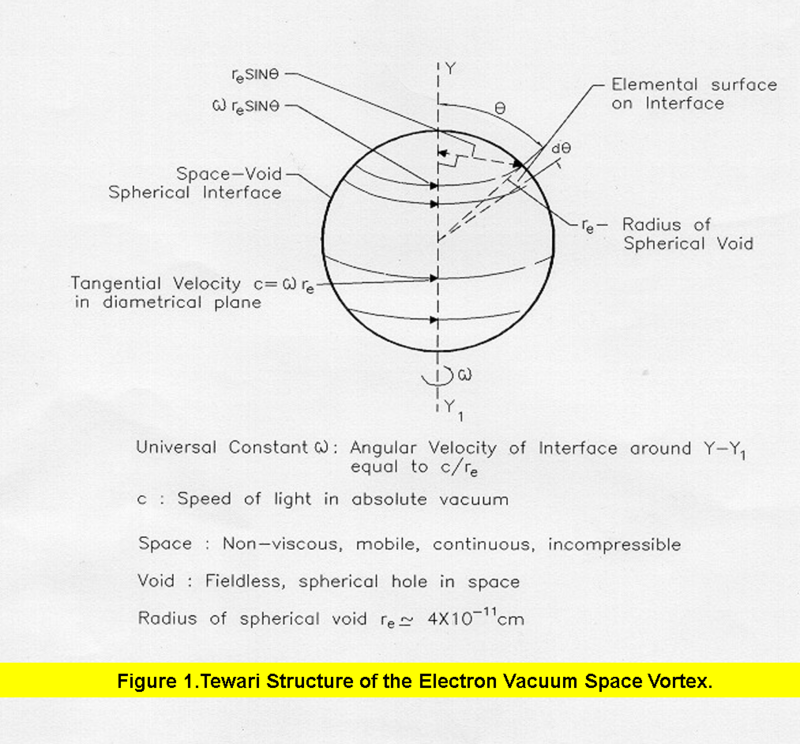 While exploring the philosophical idea that everything has a beginning, I found Mr. Tewari’s paper titled, Structural Relation Between the Vacuum Space and the Electron. His paper reveals how the first fundamental particle in the universe, the electron, was created through the transformation of energy. 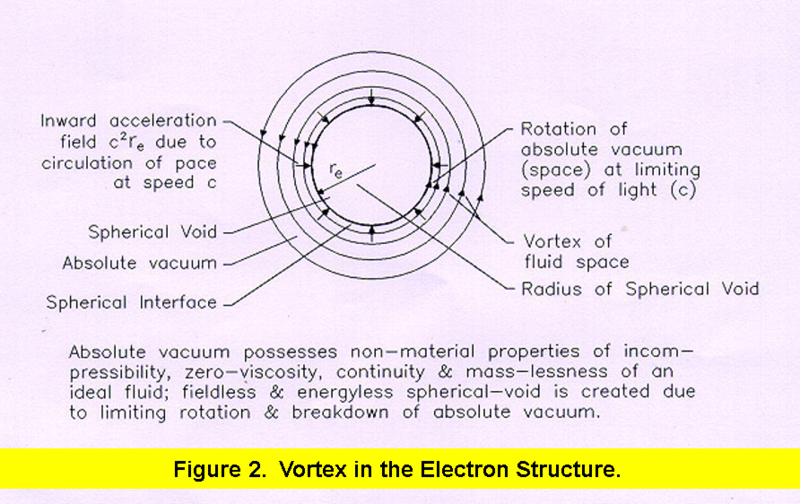 He developed a space vortex structure that mathematically verifies how energy in space creates the electron and calculated many of its properties, such as charge and mass. Further, he demonstrated creation of electrons by building a generator that produced efficiencies greater than one and as high as 2.38. 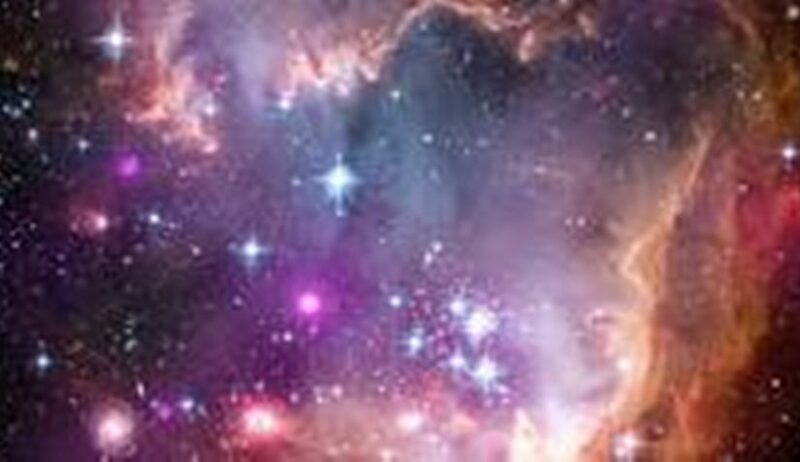 Mr. Tewari’s astonishing find that the electron is the first fundamental particle created in space triggers a conception of how the universe began. The Periodic Table of Atomic Numbers reveals that the electron intimately exists in the formation of every atom and therefore may be key in the creation of inorganic and organic matter. To conceive how the universe began, it may be that that the electron was created millions and trillions of times to eventually form atoms that are the basic building blocks of all matter. What is illuminating is that even the electron has a beginning, which supports my philosophical belief that everything has a beginning. A review of elements listed in the Periodic Table of Atomic Numbers verifies that the electron may be the mastermind in the creation of atoms. 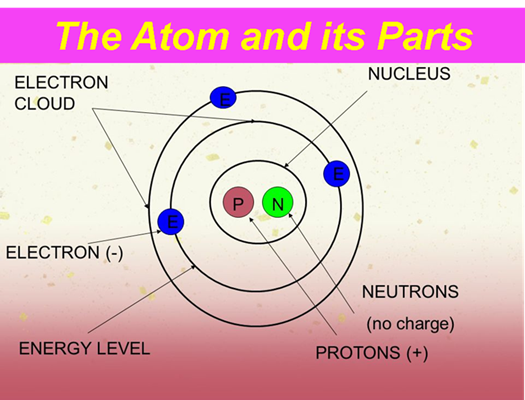 For every element, one or more electrons revolves around the nucleus of protons and neutrons of its atom. Normally, the electron equals the number of protons, which determines the atomic number of the element. It is the inherent ability of the electron to coalesce protons and neutrons in atoms that determine the characteristic of each element. Therefore, the electron may be the fundamental particle that is responsible for creation of inorganic and organic matter in the universe. Posted on August 21, 2018 September 25, 2018 Categories Articles, PhilosophyTags Atom the building block of matter, Beginning of the Universe, Big Bang Theory, Everything has a beginning, Fundamental particle the electron, Nicholas Ginex, Paramahamsa Tewari, Space Vortex Theory, Table of Atomic Numbers, The atom and its parts, The electron, Transformation of energyLeave a comment on Did the Electron Begin the Universe? Article Description: The phenomena of pulsars, quasars and black holes throughout the universe emits radiant energy and matter back out into the universe, which cause the creation of star-filled galaxies. These phenomena challenge the accepted idea that one Big Bang singularity created our universe. Nicholas Ginex concludes that all things have a beginning, even our universe. He believes there is a conscious force that ultimately desires to create conscious-living entities. He further hypothesizes that this unknown force is to enable such entities to eventually understand the creation of the universe and the purpose of their existence. Author Comment: Scientific findings in quantum physics confirm that particles throughout space have evolved to form atoms that have become the basic building blocks of matter throughout the universe. Did an infinite number of atoms form the Big Bang singularity that exploded matter to populate the universe or, was it due to atoms creating pulsars, quasars, and black holes that emit energy and matter back into the universe to form billions of star-filled galaxies? In either case, is there a purpose of the universe to cause the creation of conscious-living entities? 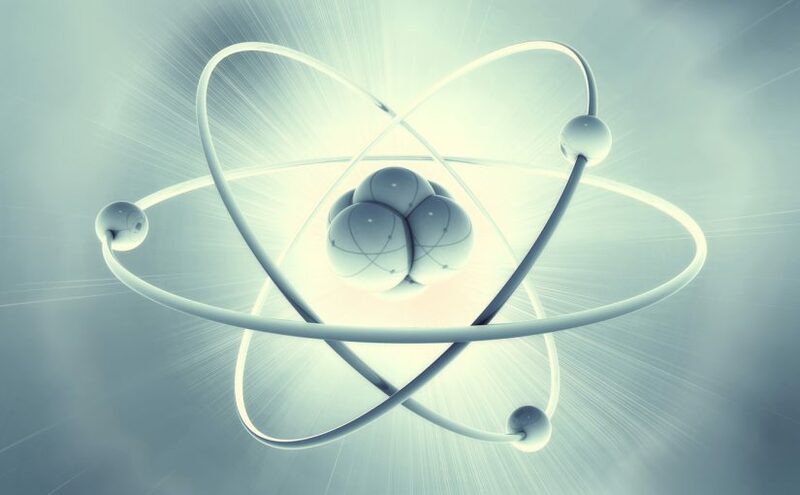 It is evident from discoveries by quantum physicists that particles evolved into atoms. Through the force of gravity, infinite numbers of atoms coalesced to form enormous stars. We learned though the astrophysicist, Carl Sagan, that stars can become unstable or explode due to gravitational forces that cause extremely high pressures and temperatures. The gravitational forces are so immense that astronomers have found it is responsible for pulsars, quasars, and black holes to exist. These entities eventually reach a state whereby they will explode or emit matter, gases, and radiant energy back out into the universe. This is a continuous process that creates the millions of stars that develop multiple galaxies throughout the universe. It becomes obvious that gravitational forces create such intense heat and high pressures in pulsars, quasars, and black holes that it is incomprehensible to believe that the entire universe was populated by one singularity called the Big Bang. 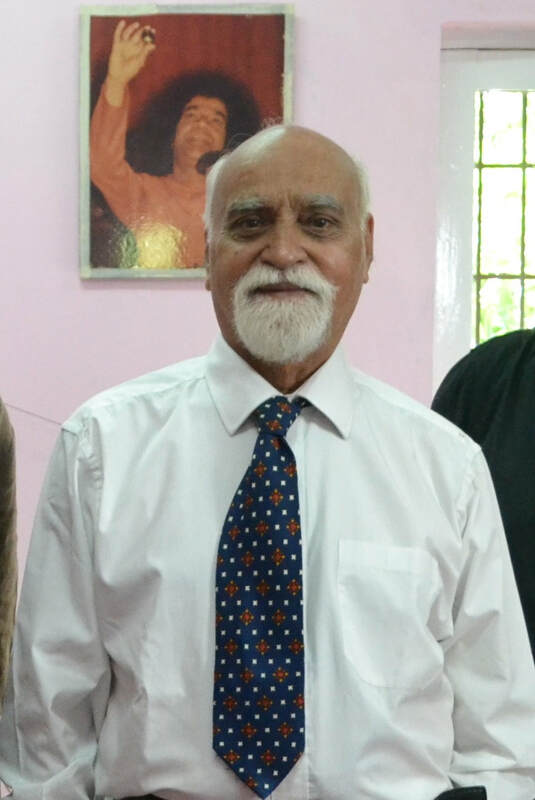 A Persian author, poet, philosopher, and great Islamic historian and scholar, Anwar Shaikh, wrote that consciousness is an inherent force in organic matter. Born in Gujrat, Punjab, India, Anwar lived between the years 1928 and 2006. His thoughts on consciousness and quantum physics compliments this author’s idea about the beginning of the universe, namely, “Everything has a beginning, even the cosmic universe”. But does consciousness have an ultimate goal in the creation of life-forms to serve a purpose? Truth depends on the ability to love one another, to listen with objective reasoning that sustains a compatible relationship with others. It is this attribute that is inherent in consciousness; for it instills a reproductive desire in all organic life forms to promote their existence. Can love for one another be the evolutionary purpose of Consciousness? To attain the apex of development that is the crown of being, consciousness may have as its purpose the ability for intelligent organisms to love all life throughout the universe. This apex or purpose of consciousness is challenged today by a religious ideology that has, since its inception, caused bigotry, hatred, violence, and the killing of people. In the Qur’an, verse 9:33, the belief that Islam is the Religion of Truth and that Allah may make it prevail over every other religion has caused armies of Muslim fundamentalists to destroy many civilizations in efforts to subjugate people to follow Islam. People around the world need to be conscious of this regressive ideology. They need to come together to educate misguided Muslims by revealing that the Qur’an needs to be revised by advocating the greatest command given to man – love one another. Why and how people around the world can assist Muslims to develop the consciousness to love one another by revising the Qur’an is presented in an article titled, Worldwide Communication Will Expose the Quran. It is available on the Internet with an Internet search on the title. In closing, the purpose of man is the will of Consciousness to propagate with the beautiful attribute of love inherent in all living entities; it is enjoyed in the reproductive ability of all organic life. It is based upon on the greatest philosophical imperative of all – love one another. By doing so, mankind may exist long enough to someday find there are other living entities in the universe that have also learned to exist and survive by acknowledging the attribute of Consciousness – love. Comments are welcomed and will be responded to.